There is a requirement to access the PDF report (Scheduled BO reports saved in PDF format) using BO Deski / Webi report by link. The link should be dynamic whenever the report migrated from one environment to another environment (DEV to TEST or TEST to UAT or UAT to PROD), because PDF reports are different for each environment and those reports stored in separate folders for each environment. So that, it doesn’t need development for each environment migration to pick the correct PDF location through the Deski Link (URL) report. Note: Reason for PDF report is, all the Deski reports are having more than 30K pages and it will run more than hour and mostly user should not change / modify the report or data. All the required Report PDF’s are stored in Windows Share points sever through BO scheduler via FTP location like below. The above listed Deski reports should not have access to Business users. Need to create URL / Link report in Deski / Webi to provide access to Users for their Analysis. That report should dynamically access the above reports depends on the environment without changing the location on each migration. Let’s walk into Solution route..
1. 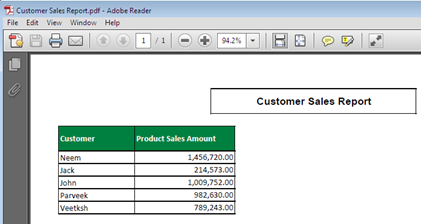 Create a dummy report (use any one simple object). 2. Create 3 variables. Imagine we are doing this in your BO DEV environment. Win_Folder –> Based on the BO system / Server Name this variable would decide which Windows server folder to point. Report_Link –> TO concatenate Windows server file path with Report. URL –> Using your report structure to access the required PDF, Hyperlink function used.=Hyperlink(<Link> ,”Click here to View ‘Customer Sales Report’ Report”). 3. Create a Blank Cell in report and use the URL variable. Click that link, it will open the PDF report in separate Window from specified location depends on the environment you have logged in. Note: Webi report is not having any of the in-built function to get BO system / Server Name (like ApplicationValue(“BOSECURITYDOMAIN”)). It’s little difficult to do same kind of report in Webi reports as for I reached. Please feel free to command your option on this. Based on further research, we cannot get BO system Name / Server Name in Webi report directly. You can find BO server name through some workaround from Universe. Create one object in universe as below. Use this object in report and create one variable as below. Note: This function will work only for thin client Webi (not for Rich client Webi report). Actually, we can get the server name through another approach. I post my ideas in here for your referent when you want to use the info in Webi report. I am not sure whether you know there have a Default Universe of Activity was used by Audit DB. You can get some useful information from it. I only post a example statement for your reference. For the detail requirement of yours, pls do the related adjustment as per your needed. I am happy to discuss with you for the further action. Thanks Jensonw! for the details and we dont have Audit DB build in our organization.